Online hemodiafiltration provides greater removal of higher molecular weight uremic retention solutes than conventional high-flux hemodialysis. However, online hemodiafiltration is used sparsely in the United States in part because of a paucity of delivery systems cleared for clinical use by the US Food and Drug Administration. Although a pathway for regulatory approval exists in the United States, concerns remain, particularly regarding online production of the large volumes of sterile, nonpyrogenic substitution fluid infused directly into the bloodstream to maintain fluid balance. Clearly defined testing protocols, acceptable to Food and Drug Administration, will be useful to show that an online hemodiafiltration system is capable of routinely achieving a sterility assurance level of 10−6 and nonpyrogenic levels of endotoxin. Large-scale clinical experience has shown that systems providing this level of performance when combined with certain design features, such as redundancy, and an appropriate quality management process can routinely and safely produce substitution fluid for online hemodiafiltration. The Kidney Health Initiative (KHI) is a public-private partnership between the American Society of Nephrology, the US Food and Drug Administration (FDA), and over 75 other member organizations that was formed to promote the introduction of new therapies for the treatment of the kidney-related problems in the United States (1). As part of that effort, the KHI established a workgroup to examine pathways for the approval of therapies already marketed in Europe and Canada. One such therapy is hemodiafiltration (HDF). This review examines factors to be considered in gaining regulatory approval for HDF systems. The prescription of HDF and the clinical evidence that HDF provides benefits beyond those obtained with conventional hemodialysis (HD) are covered elsewhere (2). HDF combines the high diffusive clearance of small molecules obtained in HD with the superior convective removal of larger molecules obtained with hemofiltration (3,4). Online HDF uses a high-flux hemodialyzer with a membrane having an ultrafiltration coefficient >20 ml/h per 1 mm Hg per 1 m2 and a sieving coefficient for β2-microglobulin of >0.6 to deliver a convection volume of at least 20% of the total blood volume processed (5). Appropriate fluid balance is maintained by the dialysis machines’ ultrafiltration control systems and infusion into the patient’s blood of a sterile, nonpyrogenic fluid produced online from dialysis fluid. Although the technology for the realization of online HDF has proven to be safe and sustainable (2), online HDF is essentially absent from the options for RRT in the United States. There are likely many reasons for that absence, but one of the most important is perceived to be regulatory barriers to the availability of systems for performing HDF. This review examines the regulatory pathway for HDF systems and the quality requirements for provision of substitution fluids for online HDF. It further discusses approaches to meeting concerns expressed by the FDA in considering submissions for systems capable of delivering online HDF. Because the results of randomized, controlled trials suggest that high convection volumes are required to achieve clinical benefit (6,7), the scope of this review is limited to systems intended for medium- and high-volume online HDF that generate substitution fluid online. In the United States, such systems are considered medical devices by the FDA as opposed to prepackaged bags of solution for direct infusion, which are considered as drugs. To date, the FDA has cleared [class 2, under 510(k)] one system (Nephros OLPūr H2H Hemodiafiltration Module and OLPūr MD 220 Hemodiafilter) with the intended use of providing online HDF to patients with ESKD. General recommendations for submissions to the FDA for HDF systems are available in Guidance for the Content of Premarket Notifications for Hemodialysis Delivery Systems (8) and can be found at http://www.fda.gov/downloads/medicaldevices/deviceregulationandguidance/guidancedocuments/ucm080164.pdf. HDF systems are not “monolithic” and might include more than an HDF machine and a high-flux hemodialyzer. These other components, which could differ between different systems, need to be considered in developing an approach to gaining regulatory approval for an HDF system. For example, the treated water supply system must be capable of being effectively disinfected for sterile, nonpyrogenic fluid to be generated. In that case, the disinfection process would be an integral part of the clearance or approval of an HDF system. In addition, accurate control of fluid balance and ultrafiltration must be shown to protect against fluid overload or depletion. Finally, the additional pump and tubing for substitution fluid infusion must have appropriate safety monitors. Whether clinical data are necessary to support a 510(k) submission is on the basis of the intended use of the device under consideration and the technologic characteristics of that device. In general, devices intended for a new population or indication are more likely to require clinical data than devices for which there are very similar devices (predicates) on the market. The FDA guidance document for HD systems states that a clinical trial may be necessary to show the efficacy and safety of the process used to prepare substitution fluid for online HDF depending on the device. Such clinical studies may require prior approval by the FDA via the investigational device exemption (IDE) program depending on the level of risk associated with the device and its clinical application. Companies and investigators are encouraged to engage in discussions with the FDA via the presubmission process to ascertain the need for clinical studies for any device, including those for HDF, and the parameters of those studies. If a clinical trial is required by the FDA, it should include an assessment of adverse events, including but not limited to fluid imbalance, infection, and pyrogenic reactions, compared with traditional HD systems. Bench testing should be used to show that substitution fluid meets the United States Pharmacopeia (USP) standard for Sterile Water for Injection, examine the potential for biofilm formation, and show the integrity of any filters used to prepare substitution solution over their stated life. Finally, device labeling should include instructions for performing microbiologic testing, disinfection procedures, requirements for feed-water quality, and filter use. Table 1 lists various concerns (deficiencies) expressed by the FDA during the review process of submissions for either IDE studies or marketing applications for HDF systems. The main concerns were study design (including the statistical plan), sterility, performance (bench) testing, labeling/instructions for use, and software. The main issues related to study design included the appropriateness of the proposed end points, methods to assess fluid balance, and the required data to support the intended use. It should be noted that, for IDE submissions, approval is not dependent on specific end points. However, the FDA may consider the suitability of end points in marketing applications on the basis of current clinical standards. To protect patient safety, proper methods to assess fluid balance are crucial for any IDE study or marketing application for an HDF device. Also, the risks and consequences of introducing microbial contaminants into a system that delivers large volumes of fluid directly into the patient are paramount concerns during the review process. The recommendations set forth in FDA’s guidance document and American National Standards Institute (ANSI)/Association for the Advancement of Medical Instrumentation (AAMI)/International Organization for Standardization (ISO) standards are clear: substitution (replacement) fluid infused during HDF should be sterile and nonpyrogenic. Specific issues, such as proper sampling sites and the size of filters, needed to show compliance with this requirement are frequently discussed with sponsors during the review process. During device development, testing of fluid at various points along the fluid path could be performed to ascertain the source of contamination if sterility is broken. Because HDF filters are high-flux filters and may clear middle and larger molecules, there is some concern about the potential for excessive loss of essential substances, including albumin, water soluble vitamins, amino acids, growth factors, medications, and hormones. Loss of essential substances and their effect on patient safety can often be addressed in clinical trials. Bench testing may also be sufficient to address some of these concerns, and it is possible that a description of the device (for example, membrane pore size and the sizes of substances of concern) might provide valuable information guiding bench and clinical test requirements. The goal of the following discussion is not to change standards or modify the FDA guidance document but to attempt to clarify potential questions that manufacturers and investigators might have regarding fluid quality in submissions of HDF systems to the FDA. In HDF, substitution fluid is infused directly into the patient’s blood. For that reason, the FDA considers the preparation of sterile, nonpyrogenic substitution fluid to be an essential component of patient safety. What differentiates various HDF therapies is the volume of substitution fluid used and how it is prepared (Table 2). The substitution fluid in low-volume therapies is provided by either backfiltration of dialysate across the hemodialyzer membrane or from prepackaged bags of fluid. The combination of internal filtration and backfiltration in the hemodialyzer can yield convection volumes of up to 8 L (9), with the hemodialyzer membrane providing a final barrier to endotoxin and bacteria. Modern dialysis membranes are formed from polymers, such as polysulfone, polyamide, and polyether-polymer alloy, which provide a high adsorptive capacity for endotoxins in the membrane pores (10–13). Bacteria are also trapped within the ultrastructure of the membrane, because membrane pores continuously diminish in size from the micrometer range at the outer surface to the nanometer range at the luminal surface of the hollow fiber in a funnel-like manner. In medium- to high-volume therapies, substitution solution can be prepared online by a process of ultrafiltration with bacteria- and endotoxin-retentive filters that has been validated to produce fluid that is sterile and nonpyrogenic (14,15). The labeling for HDF systems should state the minimum quality requirements for fluid inputs (water, concentrate, or dialysate) to the system used to prepare substitution fluid that have been shown to consistently produce substitution fluid that is sterile and nonpyrogenic according to the ISO standard for the quality of fluids used in HD and related therapies (14) (Table 3). The ISO standard defines sterile as being “free from viable microorganisms” and nonpyrogenic as “not eliciting a pyrogen [febrile] reaction.” The standard notes that the sterility of the fluid is determined by its production through a validated process. The standard also notes that the volume of fluid administered should not exceed the volume that would result in a total dose of endotoxin of ≥5 EU/kg body wt per hour, the generally accepted threshold dose for a pyrogenic reaction. The FDA Guidance for the Content of Premarket Notifications for Hemodialysis Delivery Systems (8) includes references to a prior version (ANSI/AAMI RD-5) of standards for dialysis fluids; however, the FDA now recognizes current standards (ISO and ANSI/AAMI) for these fluids (14,16). Proving that the bacteriologic purity of the substitution fluid meets these specifications was identified as the largest challenge faced by a manufacturer seeking marketing clearance or approval of a device for HDF. The problem is one of determining the bacterial content of substitution fluid produced by filtration technology at the very low levels required by USP and ISO standards (14,15). Meeting the specifications of the USP monograph on sterile water for injection (17) would require culturing 1000 L of substitution fluid to assure that there is not one bacterium present (a sterility assurance level of 10−6). Culturing that volume of fluid is not possible with current technologies and could be done indirectly accounting for applicable standards and FDA specifications. There needs to be simple, well defined protocols for this type of testing in both the bench and clinical settings, because at present, there is no standard method for showing that a device can routinely produce substitution fluid that meets the required microbiologic quality standards. Finally, compliance with the microbiologic standards can be facilitated by incorporation of certain design features in the device. The FDA guidance for HD delivery systems (8) provides some general recommendations for bench testing. These include the following: generation of test data to show that the substitution fluid meets the standard for USP sterile water for injection using a range of waterborne organisms and endotoxin as a challenge, testing to address the potential for the formation of biofilms, and testing to show that the recommended disinfection process does not adversely affect the performance of any filters. In the case of sterilizing filters, which are intended to retain bacteria and endotoxin, it is recommended that these bench tests be performed at the beginning and the end of the useful life of the filter. Several approaches to meeting these general recommendations for substitution fluid created by an online filtration system can be envisioned. One approach would be to perform very long bench tests, in which nearly 1000 L of substitution fluid was generated and passed through a commercially available 0.45-μm membrane filter that was then cultured as indicated above for USP sterile water for injection. An alternative approach would be to perform bench tests that show the capability of the filtration system to diminish a bacterial challenge with appropriate organisms, such as Brevundimonus diminuta and Mycobacterium abscessus, by more than five logs and an endotoxin challenge by more than three logs. A system capable of achieving that level of reduction in bacterial numbers would produce substitution fluid meeting the standard for USP sterile water for injection (<10−6 CFU/ml or sterility assurance level of 10−6) if the input to the system was ultrapure dialysate (<10−1 CFU/ml). Putting two such filters in series enhances the log reduction by a factor of two and provides a factor of safety. The FDA guidance document states that clinical testing is needed to show that the system produces substitution fluid meeting the microbiologic quality standards for USP Sterile Water for Injection under actual use conditions. However, the volume of substitution fluid used in a single HDF treatment can be up to 100 L. Therefore, it is not possible to show compliance with the bacteriologic standard by passing all of the substitution fluid from a single treatment through a 0.45-μm filter as outlined for bench testing. One potential method that could show compliance with this standard with consideration of the large volumes of substitution fluid used for HDF is to pass the substitution fluid through a filter over numerous HDF treatments, such that a sample representing 1000 L (or a volume that would statistically prove purity of the whole produced volume) can be accumulated over time. In addition, longitudinal monitoring of serum markers of inflammation, such as high-sensitivity C-reactive protein, and pre- to postdialysis changes in body temperature could potentially be used to support data from the microbiologic surveillance studies of the substitution fluid, although the multifactorial nature of inflammation in patients on HD would make it difficult to be sure that any change was related to substitution fluid quality. The preparation of substitution fluid can be considered to occur through a series of steps (water treatment, concentrate preparation, dialysis fluid preparation, and production of substitution fluid) (2). The bench and clinical testing protocols described above address the final step in that sequence: the production of sterile, nonpyrogenic substitution fluid from dialysate. Water used for preparation of substitution fluid is not the only source of bacteria or endotoxins. The bicarbonate concentrate can also contribute to these contaminants. Thus, in executing these testing protocols, the samples of interest are the dialysate and the substitution fluid. Determining low numbers of bacteria in water or dialysate requires special techniques (incubation at 20°C–22°C for 7 days using special agar plates) as described in the ISO standard and meticulous attention to the collection of fluid samples for culture and endotoxin testing. During clinical trials, samples of substitution fluid have occasionally yielded false positive results due to contamination of the sampling ports, emphasizing the importance of sampling technique (18). Identifying the bacterial species can be helpful in showing the presence of contaminating organisms, such as those typically found in the air or on the skin, as is documenting a lack of any sign of infection in the patient. The presence of live organisms in dialysis fluid samples can indicate the presence of biofilm, an attached community of micro-organisms, in the HDF system or the fluid systems providing the HDF system with water and bicarbonate concentrate. Biofilm is a dynamic mixture of living cells encased in an extracellular polymeric matrix composed of polysaccharides, protein, and nucleic acid fragments. This matrix affords the biofilm some protection against antimicrobial treatments, such as oxidizing biocides and heat treatment. Because biofilm is the preferred mode of growth for many bacteria, the presence of live organisms in dialysis fluid samples should be taken as a warning sign that biofilm could be present. The risks associated with biofilm underscore the need for designs, particularly those related to means for cleaning and disinfection, that minimize the likelihood and extent of its formation. Other design features that can play a role in reducing the risk of contamination of substitution fluid include redundancy, so that safety is assured in the event of a component failure during treatment; a system in the filtration device that automatically determines the integrity of the membrane (or membranes) with each treatment; and use of a disposable single-use filter at the point at which substitution fluid enters the blood. 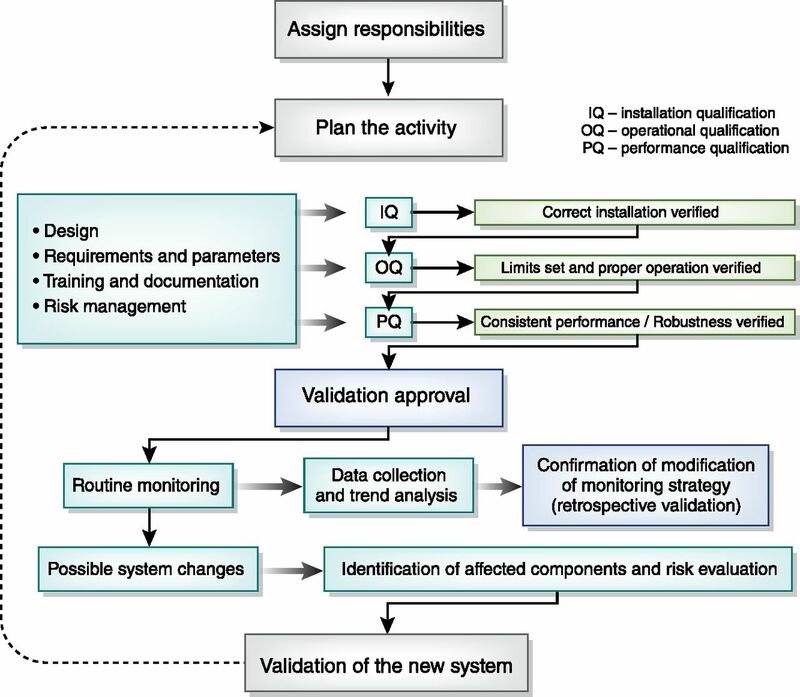 Finally, it is ideal to have a detailed quality management process, similar to that shown in Figure 1, for the initial validation and ongoing maintenance of systems for online HDF to ensure the safe preparation of substitution fluids (15,19). Use of a validation process to aid in ensuring consistent fluid quality. IQ, installation qualification; OQ, operational qualification; PQ, performance qualification. Reproduced from ref. 19, with permission. The current likely regulatory pathway for HDF machines in the United States is the 510(k) pathway. We acknowledge that there may be uncertainty regarding some of the details of some steps in that process. In particular, clearly defined protocols acceptable to the FDA would be helpful for showing that an HDF system can routinely produce sterile and pyrogen-free substitution fluid. That goal of safely producing substitution fluid of the requisite quality in routine clinical use can be facilitated by the development of quality management schemes similar to that shown in Figure 1. R.A.W. is a consultant for Baxter Healthcare, and B.C. is an employee of Fresenius Medical Care. The other authors have no relevant financial arrangements to report. This work was supported by the Kidney Health Initiative (KHI), a public-private partnership between the American Society of Nephrology, the US Food and Drug Administration, and >75 member organizations and companies, to enhance patient safety and foster innovation in kidney disease. The KHI funds were used to defray costs incurred during the conduct of the project, including project management support. However, there was no honorarium or other financial support provided to the KHI workgroup members. The KHI workgroup, including the authors of this paper, had final review authority, and they are fully responsible for its content. The KHI makes every effort to avoid actual, potential, or perceived conflicts of interest that may arise as a result of industry relationships or personal interests among the members of the writing committee and workgroup. More information on the KHI, the workgroup, and the conflict of interest policy can be found at www.kidneyhealthinitiative.org. The views and opinions expressed in this publication are those of the authors and do not necessarily reflect the official policies of any KHI member organization, the US Department of Veterans Affairs, or the US Department of Health and Human Services, and the mention of any trade names, commercial practices, or organizations does not imply endorsement by the US Government. The KHI “Regulatory Policies and Positions Affecting Device Approval in the US: Tools to Assess the Process and Foster Device Development for Patients with Kidney Disease” Workgroup’s Hemodiafiltration Subgroup consisted of experts in academia and industry and reviewers from the Food and Drug Administration who commonly assess study and marketing applications for these devices. Members of the subgroup were R.A.W., J.V., D.M.S., S.A., B.C., Greg Collins (Nephros, Inc.), William Fissell (Vanderbilt University), Gema Gonzalez (Center for Devices and Radiological Health, FDA), Shani Haugen (Center for Drug Evaluation and Research, FDA), Robert Kossmann (Fresenius Medical Care - North America), Carolyn Y. Neuland (Center for Devices and Radiological Health, FDA), Todd Snell (NxStage Medical, Inc.), Jim Summerton (Nephros, Inc.), and Shen Xiao (Center for Devices and Radiological Health, FDA). This article contains supplemental material online at http://cjasn.asnjournals.org/lookup/suppl/doi:10.2215/CJN.12641117/-/DCSupplemental. United States Pharmacopoeia–National Formulary, Rockville, MD, United States Pharmacopeial Convention Inc.